When it comes to luxury sedans, European imports are the king. The marquee brands in the luxury segment are known for their luxury options and performance features, leaving their competitors in the dust. For many years, the American domestic market was sorely lacking a marquee American luxury vehicle that could compete with the BMW, Mercedes or Lexus model lineups. Cadillac has managed to crack the proverbial code over the past few years, however, reaching impressive heights in car rankings by professional reviewers, such as Car and Driver, US News and AutoWeek. The 2016 Cadillac CTS was ranked second overall in the luxury sedan category by US News and given an Editor’s Choice ranking by Car and Driver; rankings that indicate value and performance, respectively. With a few tweaks and adjustments, though, you may be wondering if the 2017 CTS is still the kind of impressive car that you would want to take to the Executives meeting, the golf luncheon or out around town? How does the 2017 Cadillac CTS stack up in the extremely competitive luxury sedan segment of the car market? Based on its size and trim, the 2017 CTS is comfortably in the mid-size luxury sedan segment. The 2017 CTS comes with a solid array of base features including a number of tech and performance options included in the base price. At base trim, the as of yet unreleased MSRP is expected to be roughly $46,000, putting it squarely into the luxury category at pricing roughly in line with its imported competitors. In both interior space, cargo space and performance, the 2017 CTS is comparable to its peers and competitors in the luxury sedan segment. The 2017 CTS is also offered in a Sport Wagon specification which adds additional cargo and leg space in the rear for additional comfort to passengers. Every trim package comes with a number of standard features, such as a powerful and intuitive infotainment system for connectivity, a rear-view camera, a large LED touch screen in the center console, sport tuned suspension, various safety features, driver aids, performance brakes and, frankly, the list goes on from there. One of the most impressive aspects of the Cadillac CTS lineup, over the years, is just how well stocked even base models are. The 2017 Cadillac CTS has a number of separate trim packages, options, enhancements and upgrades. Cadillac chose to streamline their packages for the 2017 years, simplifying their lineup to 5 options: the CTS (base), Luxury, Premium Luxury, V-Sport and V-Sport Premium Luxury. The Luxury spec comes with a number of upgrades and options, while the Premium Luxury starts fully loaded. The V-Sport trims are purely performance oriented, starting with bigger and more powerful engines. In terms of technology, the 17 CTS comes with a number of possible connectivity and informational options. One luxury feature is the optional upgrade to a driver side heads up display (HUD) which offers an array of available information, including which song is playing on the radio at that particular moment, as well as important information for the driver, such as speed and current gas mileage. The HUD is impressive because it does not require the driver to take their eyes off the road to access this information, since it is projected onto the driver side windshield in an opaque manner, making it easy to read but also see-through. The CTS can also be equipped with a rear-mirror mounted rear view camera, or a rear view camera which is displayed on the mirror. 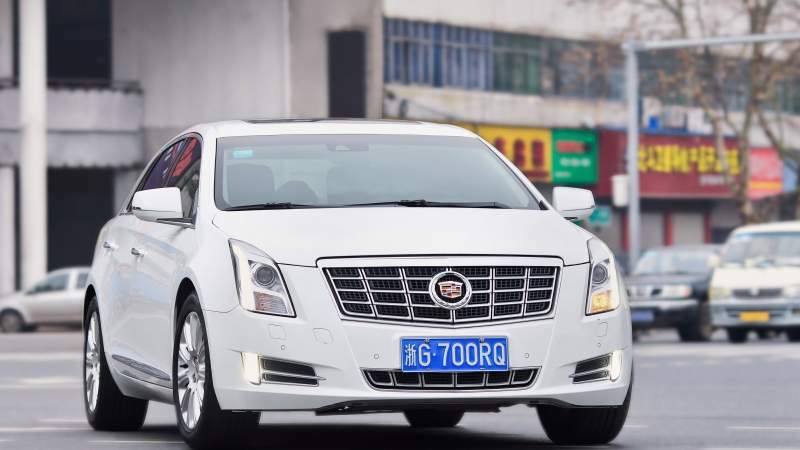 The CTS is the only vehicle that comes with that as a factory option, as opposed to a secondary market upgrade. There are a number of performance upgrades available, as well. The CTS has 3 available engine options paired with one of two eight speed transmissions that come in automatic or semi-automatic specifications. The base CTS engine is a 2.0L turbo engine that produces a respectable 238hp and 295lbs of torque. An upgraded 3.5L naturally aspirated V6 that produces 335hp is also available, and the V-Sport packages include a twin-turbo V6 that produces a staggering 420hp and 430lbs of torque. These engines are paired with sport-tuned suspensions and potential upgrades for Brembo brand sport brakes. How does the 2017 CTS compare in fuel mileage? The 2017 CTS has respectable fuel mileage for the class. At 21mpg city and 29mpg highway, the CTS lags some but leads others in the segment. This is a car that produces a lot of power and has issues keeping the fuel usage down as a result. Other cars that are as powerful as the CTS tend to have similarly decreased MPG ratings. How does the 2017 CTS compare to its peers? The 2017 CTS compares beautifully to its competition. US News ranks the CTS as tied with the Audi A6 as their best in class choice. The CTS comes comfortably ahead of iconic brands like the Mercedes Benz E Class, the BMW 5 Series, the Lexus GS class and the Acura TLX class. Cadillac’s CTS has been quietly climbing these rankings for a number of years now, finishing second in 2016. In 2017, perhaps unsurprisingly, Cadillac managed to get a little more into their vehicle without increasing the price and have come away with the best-in-class rating. Car and Driver described the vehicle as a joy to drive, listing it as “Best in Class” for 2017, also giving it the “Editor’s Choice” designation. In short, the CTS can justifiably be considered among the absolute kings of the road. Here is a brief summary in the form of pros and cons of the 2017 Cadillac CTS. The clear conclusion is that the CTS is among the absolute best at the top of the food chain. Against the toughest competition, the CTS has come out as one of the best cars available in 2017. The luxury sedan market is not for the faint of heart, and the CTS is no exception. If you are a budget conscious car buyer, this is not the car for you. There are better values in the segment, such as the Acura TLX, that produce good results for less money. If you are looking for great, instead of just good for the price, the Cadillac CTS is likely the best car you can buy in 2017. For a change, it looks like the American domestic car will be the envy of the world for the upcoming model year.